Always wanted your own Colorado Riverfront property? Holiday Shores community in beautiful Bullhead City Arizona and exciting destination close to Laughlin Nevada Casinos and Lake Mohave. Enjoy boating or desert life? Property has a private boat dock on the Colorado River. Home has main floor & lower level -- both have full Kitchens, living rooms, and renovated covered patio decks with new tile and paint. Large bedrooms and open living spaces. Spectacular river, mountain & city views. This Santa Fe style home with 5,306 sq.ft. - 5 Bedrooms 5.25 bathrooms; 4 en-suite master bedrooms with separate bath and shower, inside laundry room, 2 gas fireplaces, 3 new 5 ton a/c units. 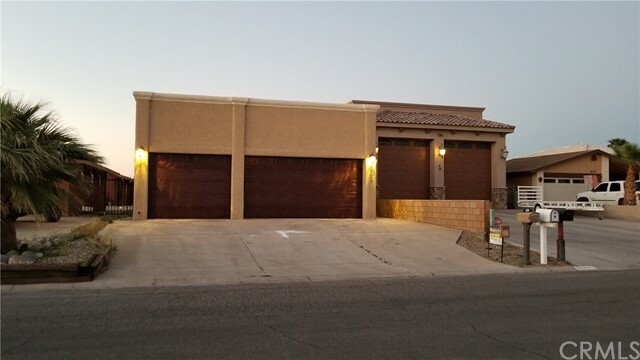 Long 225 ft. lot with backyard, fenced between home & 4-car boat deep garage with drive-through 3rd door for all your vehicles. Also a workshop with wall A/C in garage. Fenced for privacy and ready for you to enjoy. © 2019. The multiple listing data appearing on this website, or contained in reports produced therefrom, is owned and copyrighted by Multi-Regional Multiple Listing Service, Inc. ("MRMLS") and is protected by all applicable copyright laws. Information provided is for viewer's personal, non-commercial use and may not be used for any purpose other than to identify prospective properties the viewer may be interested in purchasing. All listing data, including but not limited to square footage and lot size is believed to be accurate, but the listing Agent, listing Broker and MRMLS and its affiliates do not warrant or guarantee such accuracy. The viewer should independently verify the listed data prior to making any decisions based on such information by personal inspection and/or contacting a real estate professional. Listing courtesy of Carrie Miller from Caleene Williams, Broker . Last updated Thursday, April 18th, 2019.